Wheat is a nutritious food containing Protein, Carbohydrates, Fiber, Iron and very less amount of fat. In south India , Upma is usually taken during breakfast. It is a simple and tasty dish made using Cracked Wheat. Wheat Rava Upma made using less oil is very healthy and ideal for people on diet. 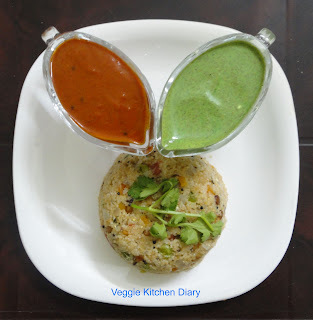 Wheat Rava Upma also fills your stomach very well. 1.Roast the wheat ravva for a couple of minutes. This prevents the upma from becoming sticky. You can skip this step, if you like. 2.Heat oil in a pan. Add the chana dal and urad dal and red chillies fry for a couple of minutes. 3.As the dals start to brown, add the green chillies and ginger, and saute for a few seconds. 4.Add the curry leaves, onions, carrots,tomatoes,peas and salt. Stir and cover and cook on medium heat for 2-3 minutes or until vegetables are cooked and onions turn translucent. 5.Add 3 1/2 cups of water and salt. Taste the water and make sure the salt is enough. Cover and bring to a boil. 6.Add the wheat rava, mix well, and cover and cook on medium heat for about 5-6 minutes or until rava is cooked. You may need to sprinkle more water and cook for a few more minutes if the rava is not completely cooked. 8.Serve the wheat ravva upma hot with mango pickle, chilli pickle ,Tomato pickle or lime pickle and curd.